Watch it in HD if you can……. My wife and I were driving back home last Sunday after a restful weekend spent doing nothing in particular. Mainly, we sat on the deck of our cabin and watched the creek flow by. On the way home, we stopped at the donut place to get our allowance of three Boston Cream beauties to share with our daughter. When it was my turn to order, I slowly and clearly stated my desire for the three identical donuts. I paid, and only when Mrs. Freelancer opened the bag to check the contents did we discover only TWO donuts. We returned the bag, pointed out the error, and received our missing pastry. No problem, right? I mean, this kind of stuff happens all the time. Chill, dude. Take it easy. What’s the big deal, anyway? For the remainder of the ride, we were discussing just how inured we’ve all become to mediocrity, and how pleased and surprised everyone is when something “goes right.” My wife works in a big office, in the Human Resources department. She happens to be, by nature, a friendly, capable, intelligent, and extremely well organized person. From what she tells me, she gets these “attaboy” emails all the time from people who are incredibly grateful to her SIMPLY BECAUSE SHE HAS DONE HER JOB CORRECTLY. Not because she went beyond the call of duty, or saved someone from a terrible fate, but because she did whatever it was that she was supposed to do in the first place. That which she is paid for. You know, the stuff in her job description. We are all used to poor performance every day, in every walk of life. I just went through some home renovations that involved carpentry, plumbing, masonry, and concrete work. And in EVERY case, had I not been working at home anyway and been able to see the guys on the job, mediocre work would have been performed and mistakes would have been ignored. Instead of doing what I needed to be doing in my studio, I found myself checking up on these bozos and making comments like “Hey, is that pipe supposed to be leaking like that?,” or “I’m pretty sure that tile has a huge crack in it.” They would always say something like “Oh, right. Yeah, I’ll take care of that,” with absolutely no embarrassment whatsoever in being found professionally lacking. Whatever happened to Old World Craftsmanship? People almost never get what they order the way they order it at restaurants, either. And if they really want to eat what they want, they have to be prepared to make a huge stink about it. Generally, I’m not going to do that. So where am I going with this? My point is that we are all completely numb to mediocrity. It’s all around us, everywhere we go. THE BAR HAS BEEN PERMANENTLY LOWERED. And we are all pretty much used to it. I don’t know what field you’re trying to operate in, but if you just make it a point of personal pride to sweat the details, people will actually take notice. Show up early and stay late. Stay on schedule. Do the work correctly. Try to have a personality. It’s amazing how grateful people are when they realize they have found someone who they don’t have to micro-manage. You will actually get work from them simply because you are reliable…..one less person to worry about. Note that I’m not talking about doing anything great at this point. This is the most basic kind of stuff. But the bar is so low in our daily lives that there are significant opportunities for advancement for those who can simply “take care of business” reliably. Just ask anyone who deals with their company’s interns and you’ll hear it chapter and verse. So when you get extra pickles instead of no onions on your burger, remember to set your own personal “bar” nice and high. And order nuggets next time. My decade-long run as a composer at All My Children ended a year ago, when ABC canceled the show after a million years. That was a great gig for me. The people were nice, the money was fantastic, and I could work at home. Most importantly, I could do other things like learn how to be a college professor, which I started doing in 2003. However, all things must pass, and like every other job I’ve had in my career, AMC bit the dust. With all of my newly-found free time, in the last year I’ve been able to write Welcome to the Jungle (the book, not the blog) and make my first ever solo CD, and as I write this, I’ve pretty much wrapped up both of those projects. Now, as the school year starts, my freelance brain is starting to churn with activity. I’m sure all of you can relate. If you’re not working on some kind of job for a period of more than seven minutes, the insecurity gland is activated, causing the brain to flood with thoughts of starvation, bankruptcy, and living in a van down by the river. So, I’m now looking for opportunities to get back into some television writing, along with working on promoting the book, launching the CD, and teaching school. I have a friend who works for a production library company that pitches music to television shows that are in production. They have good relationships with a number of shows on both cable and network television. This particular guy is a longtime colleague and close friend. I know him to be an honorable man, so I’m lucky that I don’t have to worry about getting shafted or anything. I spoke to him on the phone yesterday, and he outlined the details of what he was looking for. He is currently supplying music to one network game show and two cable reality shows, and I would be able to write cues for any of them “on spec,” meaning that I could put in the time, write the music, be paid nothing, and have no guarantee that anything would be used. There would also be no upfront money. ALSO, this company would own the rights to the music for five years, during which time they would have the right to pitch it wherever they thought they could get a bite. We would split any licensing money down the middle. Got it? OK, now put any judgements on hold for a little bit. When I first met this guy, it was probably 1998. He was producing for another library company, this time for a network that was tired of paying licensing fees. So their idea was to create their own sports library and then use it for their own shows, thus avoiding the expense of licensing outside music. At any rate, the deal in 1998 was that I got paid $750 per cue to write, record, mix, and edit sports music, also on spec. If they hated the cues, I didn’t get paid. They owned the music forever, and kept 100% of the licensing. I did pretty well as far as my rate of acceptance went. I probably wrote 100 cues for that job, and I think two of them were rejected. On the other hand, that network met with a lot of resistance from the producers of their shows, most of whom wanted to use whatever music they felt worked on a creative level rather than being forced to use the network’s library just because it was cheaper for the network. So ultimately, there wasn’t a lot of back end for me from that gig, because the music never really got used. I did make good money for my time, though. So over the course of about a year, that job actually paid my living expenses. These days, the production music business is flooded with people who are willing to work for very little up front money in exchange for the possible reward of performance royalties. What with the record business going up in flames, a lot of musicians and bands are doing whatever they can to work in the industry. The competition is ridiculous compared to a decade ago. Supply and demand drives rates up and down, and in this case, with so many musicians willing to work cheaply, rates hit the floor. So, is it “fair” that music library companies want composers to supply them with music at no cost when as recently as 10-15 years ago, they were paying hundreds of dollars per cue, up front? Well, I contend that there simply is no such thing as fair, and the sooner we all get over that, the better for our careers. What’s fair is what’s right for YOU, right now. How badly do you need the work, the experience, the money? How much time do you have? When I first started out writing TV commercials, I took EVERY JOB I COULD GET. I don’t think I turned anything down for at least five years. Everything changes. Everything is relative. Right now, I’m pretty jazzed, knowing that I have a shot to write for a network show FOR NOTHING UPFRONT, ON SPEC. I’m confident in my ability to deliver some great stuff, and I know that it will get into the right hands with a good pitch from my friend. That’s what makes it worth it for me. I’m getting an inside connection, so the spec aspect isn’t as much of a down side. To me, getting a high quality “shot” is something I’ll take a chance on every time. To mix some baseball metaphors, if my batting average is decent in this situation, I have a good chance at scoring some hits and getting into the rotation. I’ll take the performance royalties that regular play generates. Now I absolutely have friends that would NEVER do something like this. They would consider it unprofessional to ever do anything on spec, to put their time in and not be paid for it. That’s an individual call that everyone needs to make for themselves. But it’s not about “fair” or “unfair.” It’s just about what’s right for the individual. Personally, I’m not going to dwell on how things used to be, or some theoretical concept of fair treatment. I’m going to evaluate this particular situation based on what other situations are available TO ME, TODAY, and see if this one is worth getting involved with. I’ve been a music and audio freelancer for over 30 years. Over the course of a pretty decent career, I’ve been able to do a lot of different things at the “A” levels of the business. I’ve always been interested in why some people seem to cruise along from great gig to great gig, and so many others with just as much raw talent are unable to put together successful careers. For the last 10 years, in addition to being a freelance composer/songwriter/producer, I’ve also been a full time professor of Music Industry at Drexel University. Part of that job is to help prepare students to face the “real world” and the prospects of employment that face them out there. One way of doing that has been creating a course called Music and Audio Freelancing. That course required that the kids took some time to really think about what they were going to do once they left the safety of the university environment. Did they have a plan? Did they have the social skills, the time management skills, the financial know-how to manage themselves as freelancers? Did they know how to conduct themselves in an interview? Did they have an understanding of the competitive nature of the world they were entering, and what was expected of them there? After a short while, it became clear to all of us that the answer to almost all of those questions was a resounding “no.” Given those answers, I began to develop course materials designed to help the students ready themselves for what lay ahead. After teaching the course a couple of times, I realized that there was a real need for this kind of discussion. There are literally thousands of schools teaching the “hard” skills like mixing, playing the violin, using Pro Tools, songwriting, etc. You can learn some of these things on You Tube, or from instructional DVDs as well. The “soft” skills are another matter. I’m starting my tenth year of full time teaching this fall, and while most of my students are excellent, I always have a significant percentage of students who come to my classes mostly unprepared for the kind of life they will lead as freelancers in audio and music. They don’t turn their work in on time. They don’t show up on time themselves. They don’t make eye contact when I speak to them. They do mediocre work. They don’t pay attention to the parameters of the assignment and they turn their work in with incorrect formatting. They are unable to put their cell phones away. ANY of these things would KILL you, permanently, with a client in the real world. Why would anyone work with someone who did any of those things when they could JUST AS EASILY work with someone who didn’t? Add in all of the other stuff, like putting together a credit list, a web site, making career plans and goals, learning about personal and professional finances, organizational skills, and networking, and you have the makings of a pretty good book. So, I wrote that book. 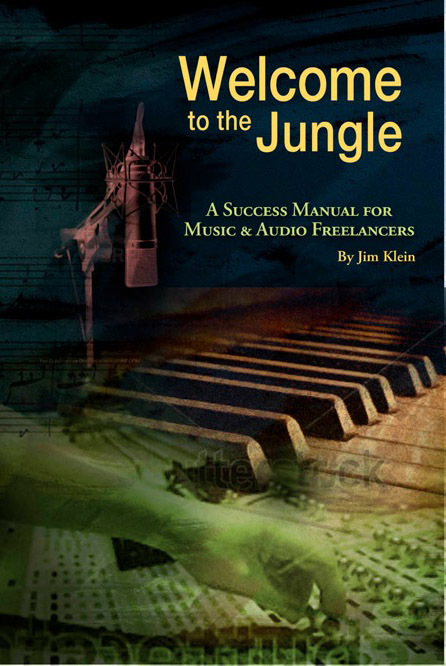 It’s called Welcome To The Jungle: A Success Manual For Music and Audio Freelancers. It’s being published by Hal Leonard Books, and it will hit brick-and-mortar stores (Guitar Center, Sam Ash, Barnes and Noble) and e-retailers like Amazon and Barnes and Noble January 15th. Obviously, I think it would be a great idea for everyone to run out and buy the book as soon as it becomes available. But this summer, while I’ve been involved in doing the final work on the book, recording my first solo instrumental CD (more on that later), and getting ready for the new school year, it occurred to me that there are topics worthy of discussion that were not included in the book for one reason or another. This blog is going to be a place where I can talk about some of the things that are going on in the freelance environment for musicians and audio producers, engineers, composers, and the like, and hopefully get some responses from others who are interested. I work with a lot of kids who are just starting out, colleagues who are in the trenches just trying to make a living, and also with a lot of people my age, who are trying to stay relevant and busy in a “youth-centric” business and society. So, that’s why I’ve set this page up: to talk about what it’s like out there in the cold, cold world, and what we can all do about staying warm and getting some work.